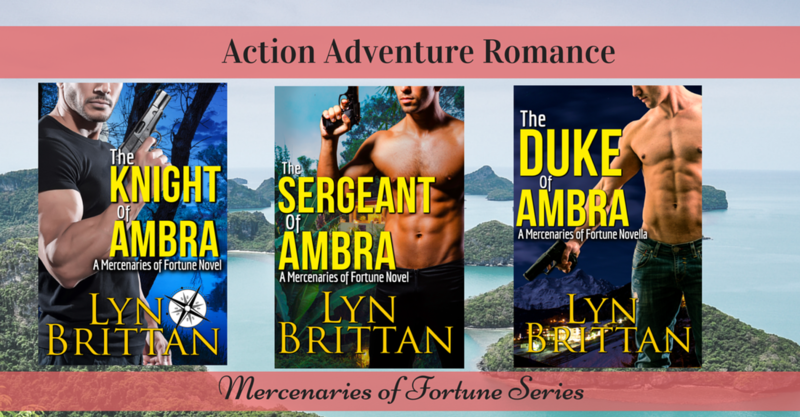 Here's your chance to start reading, The Knight of Ambra, Book 1 of the Mercenaries of Fortune Series by USA Today best selling author, Lyn Brittan. Get the artifact. Save the girl. Try not to fall in love. 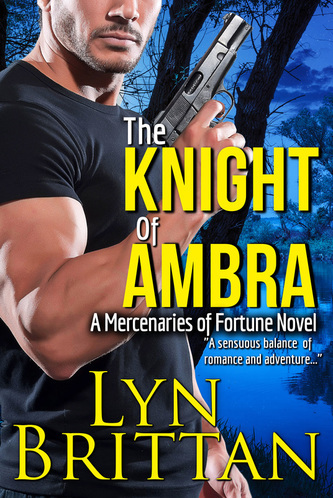 Brant Jacobs is determined not to screw up his first mission as a Knight of Ambra. Sneak in, retrieve the stolen artifact and disappear. Easy…right up until a woman in yoga pants stumbles through the wrong door at the wrong friggin’ time. She’s too cute and too innocent to be left on her own, but bringing her along might put them in the greatest danger of all. Michaela turned up the music on her headphones, threw a choice finger at the jerk who’d yelled at her, and pedaled harder through the streets of the Albany suburb that, tragically, she called home. Her life sucked and especially today. Michaela pulled her hood over her head and manually signaled a left turn. The signal lights on her bicycle had gone out weeks ago, but she couldn’t afford a repair. Buying food came first. And paying the rent. And credit cards. And the money she owed for skidding into a minivan and leaving a nice Michaela-sized dent in her wake. Basically, she owed everybody everything, and that meant weaving her bike and its attached delivery trolley through downtown streets without blinking signals. Highly illegal. If the cops stopped her that would be one more bill in the stack of things she just couldn’t pay. At the next intersection, she pulled out her phone to check messages from work. There were two along with more late notices and missed calls from collection agencies. The messages ought to have motivated her to pedal faster, but seriously, what was the point? Monthly minimum payments didn’t make a dent once interest hit. It was like swimming as hard as she could in the middle of the ocean. She was exhausted and going nowhere. She hadn’t had a proper weekend in months. And for what? A crappy apartment on the wrong side of town next to two neighbors who went at it like rabbits while their kid screamed down the hall. She would kill for a change of pace and a little adventure. As the light changed, she pedaled on like a hamster running on a wheel—a very large wheel with a blue cart painted with a design of pink suds and a purple washing machine on the back. What the boss saw as eye-catching, she saw as a daily reminder of her lame life. Her job wasn’t to question. Her job was to drop off clean clothes and pick up dirty ones. That was it. Anything beyond that was not her concern. The first few stops on the Wednesday route weren’t so bad. Mrs. Radas always placed a foil-wrapped handful of cookies on her top step, a small price to pay for leaving Michaela a bag of cloth diapers and mashed potato-stained muumuus. And peppermints. What was it about New Englanders and peppermints? Still, once the cookies aired out a bit, they weren’t half bad. She held her breath as she tossed the woman’s bag into the trolley, shoved a receipt through the slot in the rusty screen door, and moved on. Her next few stops were just as predictable. Single yuppies too busy, too stupid, or too lazy to do their own washing had laundry bags that always smelled of pot and cologne. Then she had the divorced men, whose laundry sat next to stacks of Chinese takeout and bottles of Jack Daniels. Grab a bag of dirty clothes. Leave a bag of clean clothes. Pedal to the next stop. Her life was little more than a collection of gross underoos, dreary days, and long nights alone. Life could have been worse. Some days, she had to fill in at the laundromat. She shivered remembering just how freaking gross people could be and counted her jacked-up blessings. She would take smelling skid marks over seeing them any day. Plus, she was outside and not being bothered by people. Never mind the bonus effect that miles of pedaling had on her calves. At least one part of her was fit. Bright spots, right? So, yeah, even though the chilly air made her nose snotty, and she was routinely cursed out by drivers and pedestrians alike, on the whole, it wasn’t that bad on the back of her bike. Except at this one stop. Her stomach roiled as she turned down the street full of small restaurants. Almost all of these guys had large-scale laundry deals with other companies, but one “restaurateur” kept Michaela’s boss on his toes. Michaela snorted and wiped her nose against her rain jacket as she coasted the rest of the way and massaged the cramp in her leg. She’d never actually seen the place open either–not in the usual way. It was always rented out for private engagements and meetings of similarly suited men and their sneering bodyguards. Food was served—she knew that much by the staff she’d occasionally seen walk in and run out of the place. But she never got their laundry. Ever. Most restaurants had lots of aprons and tablecloths and rags and towels, and cleaning required a large-scale service. And yet she was called out there only once a week—for one very lumpy bag. Just one. Not weird…right? To compound the not-weirdness, she never once had any laundry to return to the red-bricked eatery with the opaque windows. Michaela grabbed her scanner and tag to check in the bag that surely waited for her on the other side of the door. How many times would he mention her lisp today? She’d learned early to stick to “good afternoon,” careful to avoid t’s and s’s and the small hiss that accompanied them. She wasn’t in the mood for any of his bullcrap. She twisted to see up and down the block. In front of her was Lugesti, red-faced and trembling, with his hands sticking straight out, shaking from side to side. The cause? “You expect me to believe that? Or believe that you’re dumb enough to think that’s true? C’mon, pretty girl.” Cigar Man laughed and scratched his head with the muzzle of his gun. Oh, boy. Looks like we need a hero. To find what happens, get your copy of The Knight of Ambra in paperback or eBook from any of these retailers. Then come back and click the picture below for exclusive insider content! Share this with your peeps on Twitter, Pinterest and Facebook!